Located in the heart of historic downtown Los Gatos, California Café has long been a favorite of locals in this charming community nestled into the foothills of the Santa Cruz Mountains. California Café has a casual sophistication that makes it the perfect spot for either a special evening out or a long, lazy weekend lunch. Inspired by California’s abundant produce and seafood, Executive Chef Bobby Laggan’s menu changes with the seasons, ensuring every dish is impeccably fresh and full of flavor. Laggan, who wanted to be a chef since he was just tall enough to see over the kitchen counter, got his first experience cooking California cuisine at the Napa Valley Grille in Providence, Rhode Island while a student at the prestigious culinary school at Johnson & Wales University. After graduating, he moved to the West Coast where his talent and hard work helped him to rise from Sous Chef to Executive Chef in a few short years. At California Café, Laggan incorporates flavors and techniques from Asia, Latin America and Europe to create a one-of-a-kind cuisine. Start a meal with one or two shared plates, like the signature sweet and spicy wild boar ribs with a blackberry-ancho chili barbecue sauce. Paired with a bottle of California Zinfandel, it’s a match made in heaven. A perfectly cooked salmon-wrapped scallop served on a crispy potato cake with sautéed spinach is almost a meal in itself. Main courses range from a juicy blue cheese burger and fries to a thick ribeye steak. Those with lighter appetites will appreciate seafood options such as the green tea encrusted ahi tuna or angel hair pasta with prawns which comes in small or large portions. There are plenty of options to satisfy your sweet tooth, too. Cheesecake, crème brulee and bread pudding big enough for two to share are just a few ways you can cap off your meal. For those who prefer a savory end to the evening, there’s an artisan cheese plate with cheeses from local producers which is perfect for pairing with dessert wines. A table under the giant oak tree on California Café’s sun-dappled patio is an ideal spot to enjoy a weekend brunch with a bottle of bubbly and Eggs Los Gatos made with poached farm-fresh eggs and served with crab cakes napped in a decadent béarnaise. Lunchtime offerings are equally as tempting: salads made with verdant, crisp greens; pizzas from the woodfired oven or maybe a pasta dish the chef created on a whim that morning with ingredients fresh from the market. Inside, California Café is warm and contemporary. 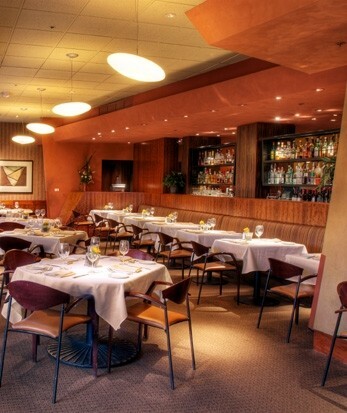 The main dining room has a view into the open kitchen with the most popular tables next to a wall of windows overlooking the peaceful Los Gatos trail. A fireplace is the centerpiece of two private dining rooms that can accommodate larger gatherings. To make a private celebration truly one of a kind, the restaurant can work with you to create a menu that reflects your tastes and to pair seamlessly with the wine you provide. For a fun evening out, there’s also a laid-back lounge where you can catch a game with friends while sharing some sophisticated bar snacks like bourbon-glazed chicken wings, beef and blue cheese sliders and beer battered broccolini. Whatever your dining needs, California Café can meet and exceed them— be it an intimate celebration, a lunch to impress a business client or a casual meal with friends. Open seven days a week for lunch, dinner and weekend brunch, California Café is a place to relax, enjoy and savor the good life. California Café, 50 University Avenue (in the Old Town Los Gatos Shopping Center) Los Gatos. (408) 354-8118. The California Cafe offers the restaurant patron a very good value. I enjoy the menu's diversity and the consistency of the dishes preparation. The staff have a genuine caring demeanor. At times service has been inconsistent but not to the point where I would not recommend this to both friends and acquaintances. This restaurant has some of the best values in terms of food quality preparation and portions. The outside patio is delightful in the summertime. Perfect for that special occasion or happy hour with friends! Twice in the last Week I have had the pleasure of dining at the California Café in Los Gatos. The first meal was a family birthday celebration and the second was a quick bite to eat during their awesome happy hour. Both times the food was excellent,the ambience was lovely, and all had a wonderful time. During happy hour are bartender/server, Jacob, was exceptional. We ordered a couple of drinks and a few appetizers one of which was the loaded tater tots which Jacob said was their best appetizer on the menu. Soon after we placed the order Jacob returned to inform us that they were out of tater tots. He apologized and asked if we would like something else instead. While disappointed we appreciated Jacob's prompt return to let us know about the change of menu. To our delight, when the food arrived not only did we have our two appetizers that we ordered but also the tater tots! The kitchen had found that, in fact, they were not out of the tater tots and had made us an order. On the house! Kudos to Jacob and to California Cafe - I look forward to my next visit!